Well done, reminds me to work even harder on the next challenge. Congrats and keep it up! “Maybe make a screenshot of the front page and save it.” :bounce: It’s the first thing I did when I saw my image on the front page !.. Thanks a lot jeremy and all of you at cgtalk for this great oportunity. Now I’ll prepare a post with some of my techniques (I learnt a lot in this production so I have to make a “résumé” of all I did), I’ll post it as soon as I can, maybe with a last update of the image (tentacles grrrr ). This image is not perfect, and all that tou said is right, jeremy, that’s all I noticed that was perfectible. So, see you soon with the next post. Hi there. Wow really inspiring work in this thread. specially for the original Dan Wade image. It looks like there’s a certain distortion and a low angle that seem to be working together. Done with mental ray for maya. Thanks for watching, cant wait for your critics and comments! Quite GOOD ;p Maybe less haunted because of the amount of light tho, but I love everything else. Thanks for the appreciation, fortunately there is no absolute meaning of the word ‘haunted’, so I tried a maybe rather idyllic interpretation. WOW! I really must take some time out and read through this amazing thead here. I am thrilled to see my concept has sparked so many incredible visions of the same piece. Fantastic work everybody, bloody marvellous! I’m off to fix a drink and I’m going to settle down for a good read of this. ANTIFAN - Welcome! I hope you enjoy(ed) browsing through your thread. 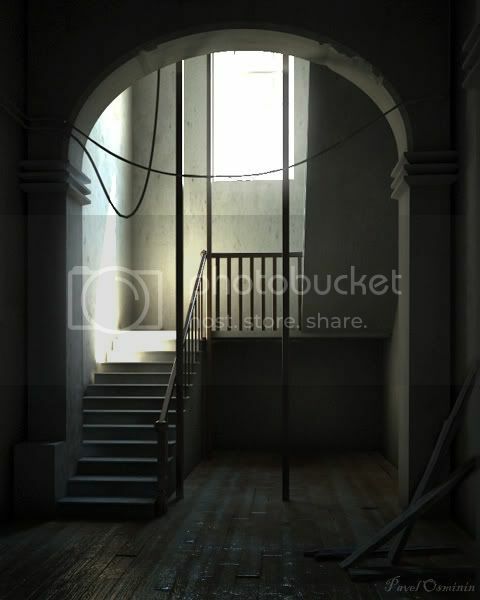 This hallway you designed is really becoming a classic excercise in lighting, and I’m sure people will continue downloading the model and practicing with it for many years into the future. delerium - I guess it’s too early to say much about the lighting, maybe watch some Film Noir dramas like The Third Man to do visual research, and think about how the gun could be defined maybe mostly in silloette or with some rims and glints to play up the metals. hasse32 - Maybe switch which software you’re using to unarchive the .rar file? Or if you have an older version of Max consider trying to import some of the other supported file formats instead. cowdude - Not sure where you’re going with the yellow blotch yet so I won’t comment on that, but as you move forwards consider some variation in terms of the saturation on the image. If all of it isn’t so uniformly saturated, then the colored areas will pop out more. storman - Nice job! It looks like there’s a little bit of a halo around some of the steps right below the sunbeam that could be a light leak. Surfacing on the floor looks good, if you extend that to the stairs and other woodwork it’ll really add to the image. I am still at near the bottom of the learning curve for 3d. The “blotch” is from a red flashlight, which is hard to see in the render. I guess Dan’s too busy lighting broomsticks to answer, so I’ll take a stab at it. There’s no DOF so no relevent aperture setting. An interesting excercise could be to bring it as an image plane (Maya term for a background image) into your 3D software and try matching the perspective in wireframe. I’d guess that the camera is positioned all the way back just inside the rear wall of the geometry, but not much further back looking through it. Yes I’ll take up on your plane suggestion should I get around to attempting this render. Yes my camera was already low at the end of the hallway. here’s my haunted hallway image. As promised, I post here a little tutorial on how I did my entry in this challenge. There nothing really new in my method, but that’s always good to remind the steps. Spent the whole morning trying to absorb this thread by osmosis and decided to give a shot. Theres probably something going against the law of physics in this shot, anyway the light is very standard positioned, the biggest achivement i made was the high contrast lights wich i tought was quite hard to get straight from the view. my name is Alex and this is my first post in this forum. I use this challenge as a chance to make my debut. I hope I have done well. I'm primarily working with Cinema 4D and I used it for this scene. It took me about 6 hours worktime for texturing, lightning and rendering. I used 9 light sources, rendering time was 5 minutes and a half without GI.